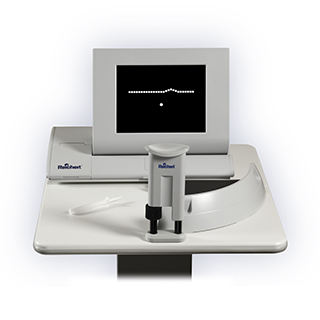 Preferential Hyperacuity Perimeter (PHP) is a new non-invasive diagnostic test that can detect changes in the macula, part of the retina used for central vision such as looking at faces and reading. 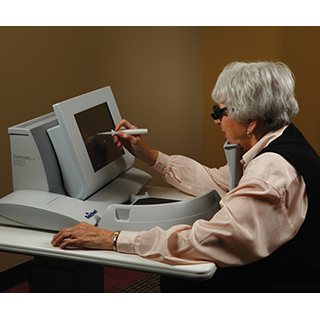 Macular conditions such as macular degeneration can be monitored and detected with PHP. High specificity and sensitivity of this test yields early detection that leads to early treatment preventing more significant damage to the eye. Most importantly, this test aids the doctor in detecting "wet" Age-Related Macular Degeneration (AMD), which severely compromise one's vision. Hyperacuity refers to the ability to distinguish when one particle is out of order compared to the other. During this test the patient will be looking at a set of lines or dots and point out the ones that are out of order. When there is distortion present in the macula, the patient will perceive the linear pattern (lines or dots) as misaligned. Patient’s responses are noted and compared to a normative database.